Yes, it’s that time of year again; when Lay’s hands their development department over to the public and lets us decide what their new flavor will be. Something I noticed the other day while in the chip aisle at the store is that the first two winners of the “Do Us a Flavor” contests were largely cheese based. The 2013 winner was Cheesy Garlic Bread and the 2014 winner was Bacon Mac and Cheese. Not that there’s anything wrong with this, but cheese flavored chips have already been around for awhile; sour cream and cheddar is a potato chip staple. Perhaps just out of chance, or perhaps out of conscious effort to not have another cheese chip win, there are no cheese flavored chips in the finals this year. Something that definitely seems like a conscious decision this year was to add location modifiers to the flavor names. This year’s finalists are: Greektown Gyro, West Coast Truffle Fries, Southern Biscuits and Gravy, and New York Reuben. Whether they did this to try and lend some sort of authenticity, to pit places against each other, or just because they thought it sounded good I am unsure. Since there are 4 chips to review I decided to break this up into two different posts instead of making it one huge one. This week’s post will review the Greektown Gryo and the Southern Biscuits and Gravy. Let’s start with the Southern Biscuits and Gravy. 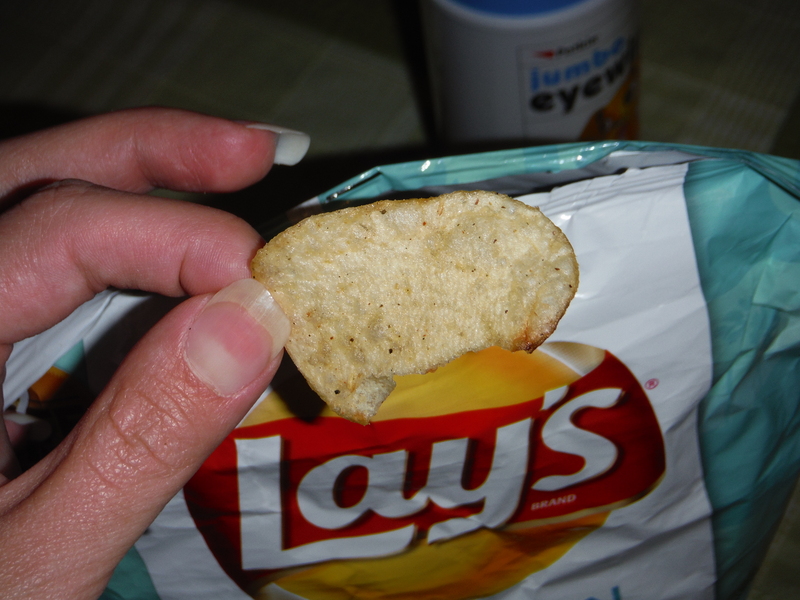 This flavor has been applied to just the standard Lay’s potato chip chip. They’re crisp, but a bit on the thin side. Obviously though the main question is about the flavor. Do they taste like biscuits and gravy? Yes and no. Or to be more precise: no and yes. You don’t really get a ton of biscuit flavor from these chips. Good biscuits are super delicious, but it’s not surprising that it’s difficult to capture that flavor in powder form for chips. However there is a nice gravy flavor. As such, they taste less like biscuits and gravy and more like mashed potatoes and gravy. Personally I find nothing wrong with that. Mashed potatoes and gravy is yummy and I enjoyed eating these. Really it comes down to what you want to judge these on. If you’re judging solely how accurate they compare to what they’re supposed to taste like, then these aren’t entirely successful. But if you’re judging based just on flavor then they can be considered a winner. Moving on to the Greektown Gyro. 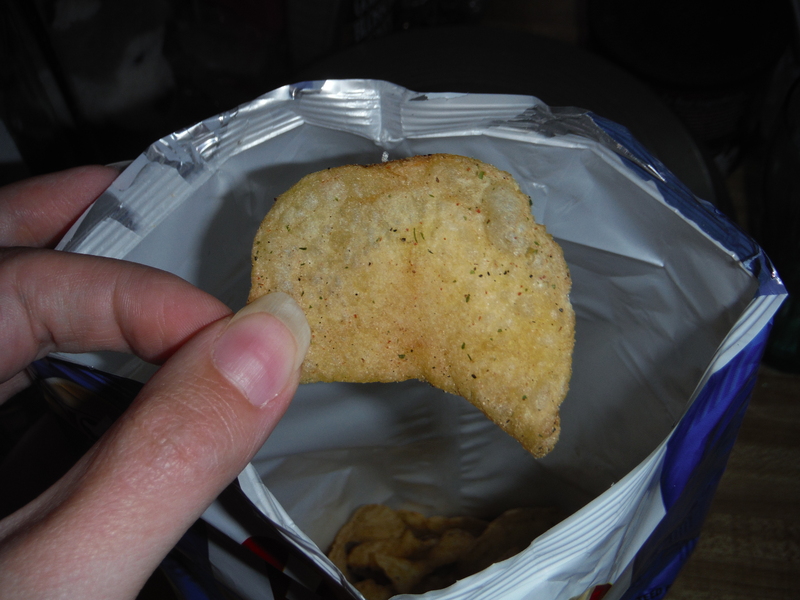 This flavor has been applied to the kettle cooked chip so it’s a bit thicker and crisper than the standard chip. I have to preface this by stating that it is a bit difficult for us to assess these without a bit of bias. Longtime followers of the blog may remember that we entered last year’s “Do Us a Flavor” sweepstakes with our flavor suggestion tzatziki gyro. And as you may be aware we didn’t even make it to the finals. 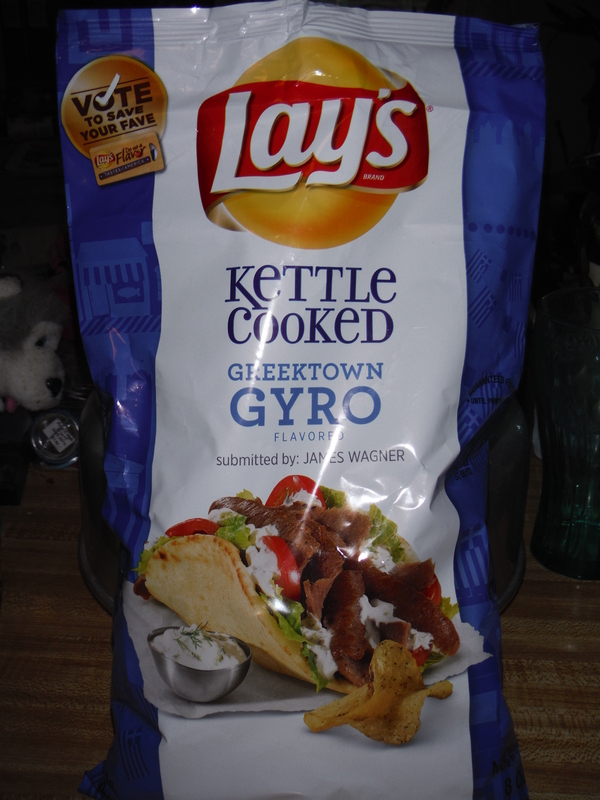 So yeah, for there to be a gyro flavor in the finals this year, we’re a bit ticked off. But we shall just have to comfort ourselves with the idea that true genius is always ahead of its time. Then there’s also the fact that if they had made it, it probably wouldn’t have turned out the way we envisioned it and that it might not have actually been very good. See the fact is these chips are really not very good at all. While we were annoyed that someone else made it to the finals with a variation of our idea, we were willing to go into it with an open mind. However, they taste nothing like a gyro. And believe me, we know our way around gyros; we’ve had some of the most amazing gyros ever as well as some of the most disappointing and many in between. These chips taste like none of them. Now, before you start whining to me, “But Meg, you said that biscuits and gravy ones didn’t taste totally like biscuits and gravy but are still good, why are you shitting on these?” there’s a very good reason. 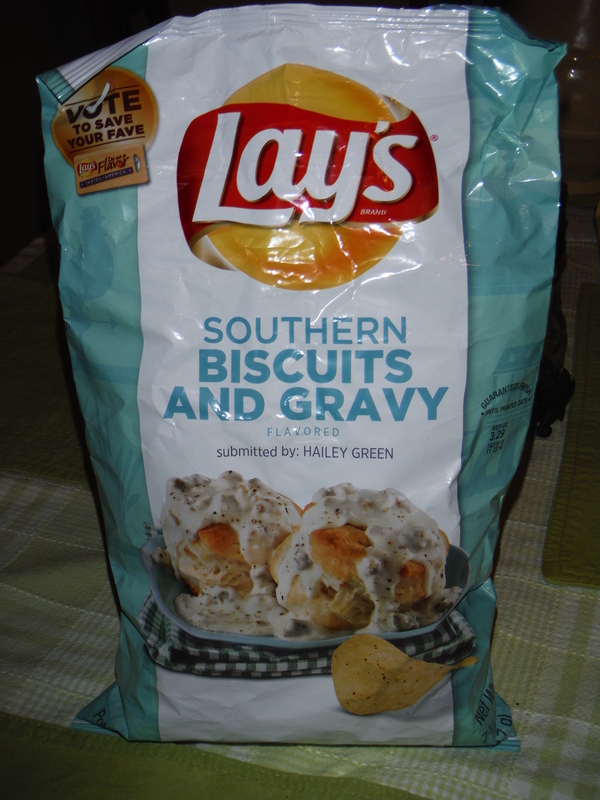 The biscuits and gravy ones actually taste good. The gyro ones do not. They are unsuccessful on both flavor replication and taste in general. I’m not even really sure how to describe what they taste like. For some reason there seems to be a strong dill flavor, despite dill not, as far as I know, being a traditional gyro or tzatziki sauce ingredient. There’s also a hint of a weird, fake meat flavor. Lest you accuse us of mere jealousy, an unbiased source (aka my dad) agreed that they don’t taste like gryos and are not enjoyable to eat. Pretty much they only thing they have going for them is that they’re the only flavor using kettle cooked chips, which some people prefer over regular chips for their crispness. The clear winner in this round is the Southern Biscuits and Gravy. Tune in next week for a review of New York Reuben and West Coast Truffle Fries. Posted on August 28, 2015, in The Snack Report and tagged biscuits, chips, crazy crossovers, disappointing, review, snacks, yummy. Bookmark the permalink. 1 Comment.